You will learn the key features and interesting facts about how filters are designed and how they work. Your certificate will be sent by mail after you complete the training course. It takes only 40 minutes to complete the training course. If you need to make a break, you can continue your learning process on any other mobile device at your convenience. 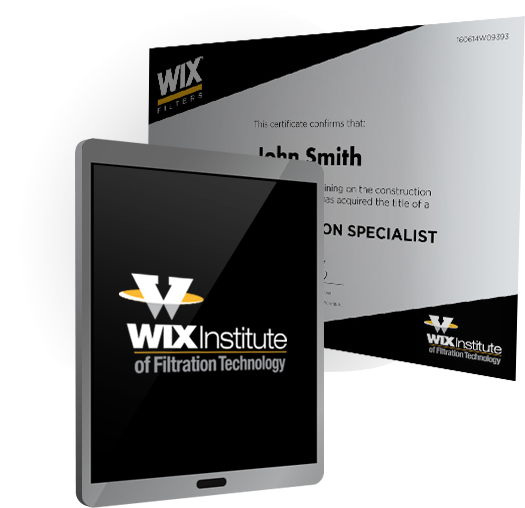 If you give us your address after completion of the training course, we will send you a framed Filtration Specialist Certificate. YOU DO NOT HAVE TO SIGN UP. It takes about 40 minutes to complete the training. You will gain unique knowledge about filtration which is useful for all people involved in the automotive industry. Your certificate will be sent by mail. Read reviews of our training. For more than 78 years now, WIX Filters has operated in the sector of replacement parts, manufacturing automotive filters for passenger cars, trucks and all types of machines and equipment designed for use in the construction, agricultural, industrial, forest and mining sectors. Whenever we create a product, its quality is our top priority.